The project is a part of GLOBE Observer, a citizen science program that lets you contribute meaningful data to NASA and the science community. 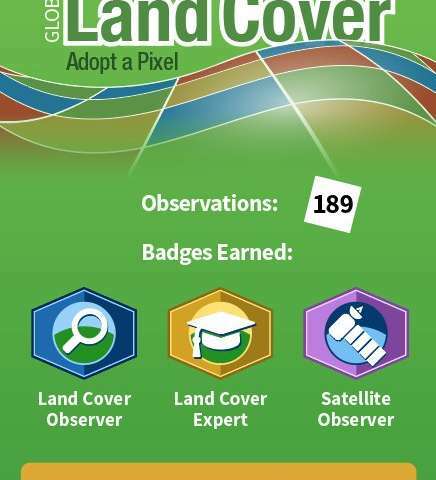 The GLOBE Observer app, introduced in 2016, includes a new "Land Cover: Adopt a Pixel" module that enables citizen scientists to photograph with their smartphones the landscape, identify the kinds of land cover they see (trees, grass, etc. ), and then match their observations to satellite data. Users can also share their knowledge of the land and how it has changed. "Adopt a Pixel" is designed to fill in details of the landscape that are too small for global land-mapping satellites to see. "Even though land cover is familiar to everyone on the planet, the most detailed satellite-based maps of global land cover are still on the order of hundreds of meters per pixel. That means that a park in a city may be too small to show up on the global map," says Peder Nelson, a land cover scientist at Oregon State University. Holli Kohl, coordinator for the project says: "Citizen scientists will be contributing photographs focused on a 50-meter area in each direction, adding observations of an area up to about the size of a soccer field. This information is important because land cover is critical to many different processes on Earth and contributes to a community's vulnerability to disasters like fire, floods or landslides." To kickstart the data collection, GLOBE Observer is challenging citizen scientists to map as much land as possible between Sept. 22, Public Lands Day, and Oct. 1, NASA's 60th anniversary. The 10 citizen scientists who map the most land in this period will be recognized on social media and will receive a certificate of appreciation from GLOBE Observer. "We created GLOBE Observer Land Cover to be easy to use," says Kohl. "You can simply take photos with your smartphone, submit them, and be done, if you like. But if you want to take it a step further, you can also classify the landscape in your photo and match it to satellite data." "Some parts of the world do have high spatial resolution maps of land cover, but these maps do not exist for every place, and the maps are not always comparable. Efforts like GLOBE Observer Land Cover can fill in local gaps, and contribute to consistent global maps," says Allison Leidner, GLOBE program manager at NASA Headquarters in Washington. For example, citizen scientists can help verify a new satellite-based map of the world's cities. "We have recently developed global maps of urban extent and man-made impervious cover from the Landsat satellite and we look forward to working with GLOBE Observer citizen scientists in assessing the quality and spatial detail of our maps," says Eric Brown de Colstoun, a land cover scientist at NASA's Goddard Space Flight Center in Greenbelt, Maryland. Some types of land cover, like crops or urban areas (e.g. commercial development, residential property, roads) can be difficult to define based on satellite data alone, says Brown de Colstoun, and this is where citizen scientists' photos can help. "As more and more of these detailed maps are developed in the future, we look forward to investigating alongside GLOBE Observer citizen scientists to monitor the changes we see from space, and to explore the drivers of the changes," says Brown de Colstoun. "These observations help us to better understand how the Earth is changing and the impacts of land cover change across our home planet." The data aren't just for scientists. "Everyone will have access to this data to understand local change," says Nelson. Citizen scientists who participate will be creating their own local land cover map. The data will be available to anyone through the GLOBE web site.